The Funky Felter: National and Local Arts and Crafts Shows: So how do you find them? And how do you participate? National and Local Arts and Crafts Shows: So how do you find them? And how do you participate? This past Saturday, my husband and I woke up early (well, early enough for me anyway) and went to a local area art festival. It is called the Plaza Art Fair and is a long standing tradition here in Kansas City. It is considered one of the top five art fairs in the country with highly competitive jurying for artists to participate. And, it gathers over 200,000 visitors during its three days. The mood and quality of artists and their work is very upscale and professional in every respect. Of all the wonderful things that there are to do here in Kansas City, the Plaza Art Fair is one of my favorites that I look forward to every year. It is inspiring and intimidating because of all the extraordinary displays of art from ceramics, to textiles, to mixed media, and beyond. I don't know that I'll ever be that caliber of artist to compete for such a coveted spot in a show like the Plaza Art Fair, but I certainly love to go see who this year's artists are and what exquisite things they make. Personally, participating in public venue shows can be a bit nerve racking to me. I consider myself an introvert in such settings so it is more difficult for me to comfortably chat with browsers and handle the crowds. Usually, I choose to only do a few arts and crafts fairs during the year, but I would like to step out of my comfort zone and start doing more. In Fall of 2007, I participated in my largest show yet, the Strange Folk Festival in the St. Louis area, and had a wonderful time! I also learned a lot about selling in a large public venue, but unfortunately, this year, my schedule did not permit me to do that show again. (If you are in the area, I do highly recommend that you go check it out!) I am however thrilled to have been accepted as a vendor in the No Coast Craft-o-Rama in Minneapolis on December 5th & 6th! You may have read my previous post about it. This is really the only large public venue show that I've planned to do this year, and I am in full force making things for it. I hope it turns out to be a fabulous event for everyone involved. Whether or not you choose to be a vendor at local or national shows, I always encourage artists and crafters to attend as many of them as they can - just to browse and chat with the vendors. These events are food for the artist's soul and can be quite eye-opening to what is currently popular in the world of arts, crafts, and design. Below you'll find a list of resource information on where to look for local shows and other artsy events. You'll also helpful to links arts and crafts show preparation. And, before I sign off for this post, for those fiber artists out there, I just wanted to share two fellow fiber artists that I found at the Plaza Art Fair this past weekend. Annaesthetic, a.k.a. Anna Shapiro, is a woven textile designer that produces the most lovely scarves, shawls, and other clothing accessories - just amazing! Also her booth display was terrific. It was like a little boutique. And, Miriam Carter is a traditional feltmaker who had a variety of scarves, hats, and other clothing. Her lattice style felted scarves in many different colors are a classic. Now on to some resource info . 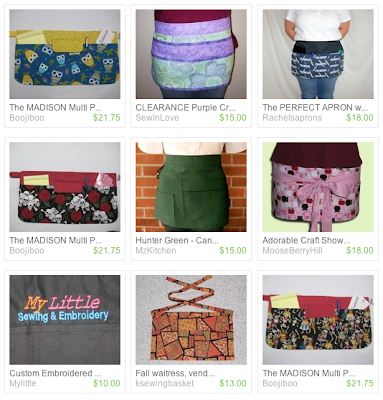 . .
**The image is a screen shot of some handy dandy craft show aprons that I found doing an Etsy search for "craft show apron" - these would be very useful and are super cute!